Student Health Ambassadors at The Sixth Form College, Solihull celebrated Valentine’s Day by exploring the theme of healthy relationships. Students are invited to join the Health Ambassadors Scheme as an enrichment option. It is an option that is particularly popular with students considering careers in medical fields, including nursing, childcare and health and social care. Michelle Burton, a young people’s health advisor from the Birmingham Community Healthcare Trust, came into College to train the students prior to the event so that the students could deliver their healthy living messages to fellow students. The event included a stand, set up in the Refectory, which provided the opportunity for students to interact with the Health Ambassadors. Games provided the opportunity to explore ‘What do I want in an ideal partner?’ and ‘What do I expect in a healthy relationship?’. Opinions differed and it promoted a good deal of discussion. Over 100 students engaged with the activities over lunch and break time. Among the literature available for students to pick up from the stand were leaflets from the Umbrella service for under-25s. Further information is available at https://umbrellahealth.co.uk/. 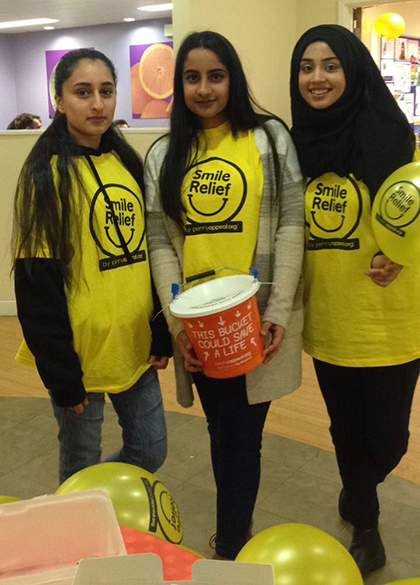 Also this week, students got involved in a charity event to raise money for the Penny Appeal Smile Relief. Students sold cupcakes, sweets and sold raffle tickets to raise money. All funds are in aid of schools and orphan care around the world. The Penny Appeal sets up and maintains schools and orphanages in developing countries, giving orphans and poor children the chance to learn.